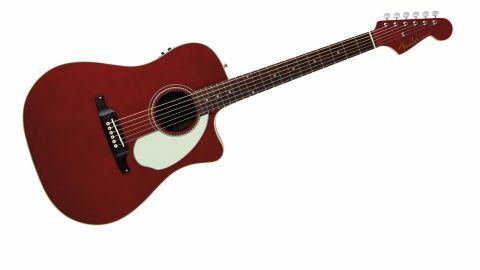 A good sounding, great looking, top value for money acoustic: are you ready to be noticed? Fun, attractive retro looks. Surprisingly 'grown-up' sounds. Excellent build quality and value for money. The looks won't be for everyone. Fender calls the Sonoran a 'tight' dreadnought, meaning that it has a slightly tighter waist and marginally smaller dimensions all over than Martin's dreadnought blueprint, though it is nearly five inches deep at the endpin. "Finished with tidy binding, an attractive checker rosette and quirky-shaped pickguard, this surpasses cheapo-box status by a massive margin"
There's a solid spruce top supported by scalloped X bracing and the guitar displays the kind of modern precision manufacturing that is such a far cry from what we had to deal with on lower-end acoustics of yore: pretty impressive all around. It's a nice surprise to find a proper bone nut and saddle installed and the Sonoran's neck, with a full 643mm scale, is just under an inch longer than a Stratocaster from endpin to headstock tip. It's also set up to play very well straight out of the box: stable tuning, easy actions - exactly the kind of experience that will encourage you to play more. Finished with tidy binding, an attractive checker rosette and quirky-shaped pickguard, this surpasses cheapo-box status by a massive margin; in fact during its time with us, it was hard to liberate from anyone who picked it up. As any politician will tell you: likability goes a very long way. The neck is maple and with a comfortable C profile and medium nut width (measured 43.2mm for the Sonoran) and feels instantly familiar to anyone au fait with a Stratocaster, for example, not least because of that unmistakable six-on-a-side Strat headstock. "The Sonoran sounds surprisingly big and grown-up, given its fun appearance"
The Sonoran sounds surprisingly big and grown-up, given its fun appearance, with a good dollop of dreadnought bass and sparkly highs that pushes the midrange back slightly; it's a satisfying strummer and a reasonable picker played purely acoustically. We think the maple neck adds its own sonic stamp to proceedings as well; it's subtle but the midrange focus is different from a lot of solid spruce-topped, mahogany necked mid-price electros... and boy are there a lot of them. We're not aware of a rule book that states that acoustic guitars must be wood-coloured, but outside of the odd sunburst and black, the vast majority certainly seem to be varying shades of brown. Right from the off, then, this fun-packed Fender offers something different from the norm and that may be enough to win it friends. That it's an easy player with satisfying sounds and capable electro-acoustic abilities to boot adds up to an easy buying choice if you're taken with the looks.